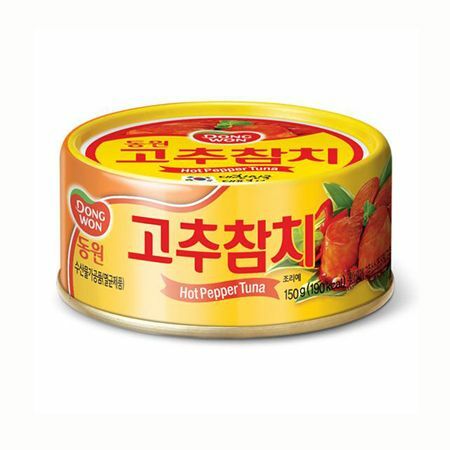 Koreas most popular flavored canned tuna. Seasoned to be both sweet and hot, using a special hot pepper sauce. The tuna-vegetable mix assures good nutrition and an excellent flavor. Dongwon Tuna is guaranteed to be of the highest quality, the freshest taste, and one of the best sources of protein. Caught by our fishing fleets in the South Pacific regions known for their clear waters, the tuna are instantly prepared and frozen in hygienic facilities at our Changwon Plant, which is known as one of the largest plants in Korea. Always thinking of the customer’s convenience, the processed tuna is then packed into convenient, safe and easy-to-open pull-tab cans. 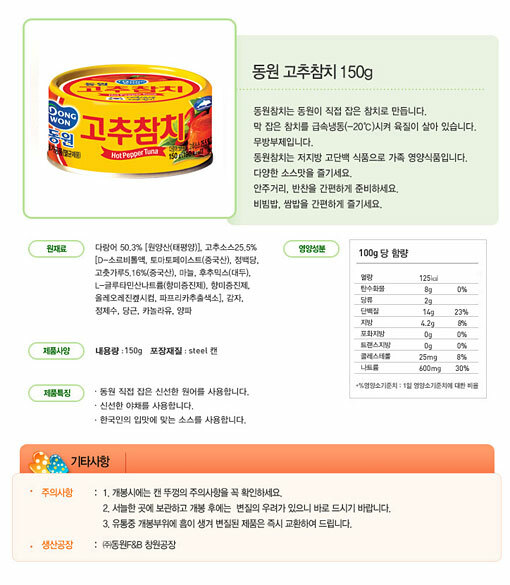 Dongwon Tuna is the only tuna product with the KS (Korean Standards) mark. Dongwon is renowned for having the worlds largest tuna fishing fleet.